Wine-Water Picher Tankard Jug Claret (Orangeade Orangade). (jug 11.6" tall. This Jug is in GOOD. Original defect on the lip of jug (. 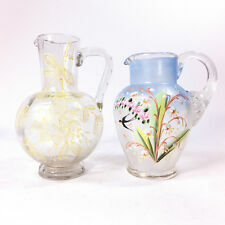 Large Pitcher & 6 Large Gobelets-Glasses. Antique French Wine-Water Glass S ervice. ). This is a Very Decorative Antique Brass Pitcher with Beautiful Intricate & Ornate Interlocking Leaf Designs as well as Islamic Calligraphy. LA AC 4301. Hello, you are viewing my sale for an Antique Arabic Middle Eastern Copper Teapot Water Pitcher with a Marked bottom and marked side. There is a Long Spout to this copper teakettle water pitcher. There are no breaks or repairs. 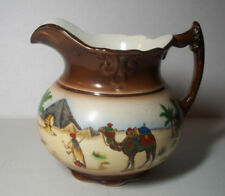 Vintage amazing Egyptian Ware ceramic pitcher jug colorful pyramids camel art! This is gorgeous antique pitcher! It stands 6" tall and 7" wide from lip to handle. Such amazing colorful depictions of Egypt! Would make a fine gift! I am NOT an expert in any field of collecting. We want to give you a positive buying experience. This item is a 1/2 Gallon wooden pitcher marked with an impressed crown mark with a "VR" directly below it. VR stood for Victoria Regia and was the mark for Queen Victoria's Royal Navy from 1837 to 1901. 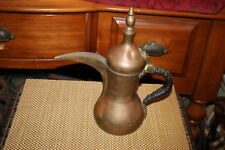 This is a nice Antique Brass Middle Eastern Pitcher. LA AC 2877. Pitcher features a diamond & file pattern. The rim is scalloped. Good condition. Small bubbles in the glass and mold lines. No cracks. A small bruise in the glass on one of the diamond points. Antique Metal Decorative Tall Pitcher with Floral & Leaf Engraved Designs 20"
Vintage Hand Painted Water Pitcher Gold Trim 8.25"
This pitcher is striking to look at. The pattern is very precise and difficult to achieve. The colors are very nice and the gold trim is beautiful. This is a very unusual pattern for a pitcher. There are several places where the paint has chipped off the floral patterns. If you don't see what you are looking for ASK. We may have it or know where it can be found. Blue Jadeite glass cream pitcher with lid. Tiny chip on base edge, visible in photo showing the handle side. Condition is good one small flake next to handle top on the rim I never even noticed it until I got out the magnifying glass for a final check, The pitcher still displays nicely just as the photo's show. Circa 1860 English Staffordshire Puzzle Jug by Elsmore & Forster. The puzzle jug has a hole in the bottom and under the inner rim of the handle. 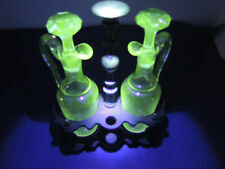 As a trick, the jug could be filled with a finger placed on the respective holes. This pitcher is in very good condition with minimal wear present. Decanter is in very good condition with no cracks, scratches. Whisky plaque is stamped "Sterling". Base stamped "Newport Sterling". Decanter is a beautiful item! BEAUTIFUL IRIDESCENT COLORS BLUE,PURPLE,YELLOW. FLOWERS COLORS ARE VERY VIVID. SEE PICTURES. A vintage Rexxford cut crystal pitcher in the Chesterfield pattern. The pitcher features vertical and oval cuts that flow down to a lovely "starburst" at the bottom. Made in Bavaria, West Germany. A couple of tiny air bubbles from manufacturing, no other issues observed. The pitcher measures approximately 7.5"h x 7" wide from middle to end of handle. It weighs 3.2 lbs. Etched Rexxford on the bottom. An elegant and striking piece of cut crystal!. Vintage Crystal Glass Diamond Point Liquor Decanter & Stopper - 16" Ht x 4 1/4"
Decanter is in very good condition with no cracks, scratches. A small chip exists on under silver plate ring around neck (see photo). Label states "Port". Decanter is part of a set of 2. This is the left item. Decanter is in very good condition with no cracks, scratches. A couple of rough edges/spot but very minor. Surface wear on base. Pitcher has unique spout and twisted design handle and is footed. Bowl with grapes design hand painted. Small chip on spout of Pitcher. Stunning Pressed Glass Plum Colored Lemonade Pitcher with 8 Matching Tumblers. Heavy Well-Balanced 4-Footed Pitcher. The rim and wood grip handle are painted black for a farm fresh look. Red Bucket. You can use as decoration or to fill up drink. A vintage grand cut crystal pitcher with gold tone mounts and handle. Comes with a glass ice insert. The pitcher measures approximately 12"h x 6.5" in diameter at the base. It weighs almost 6.25 lbs. There are some surface scratches and wear marks on the bottom. The cork on the ice insert is old and starting to disintegrate. It can be removed and replaced. There is slight wear to the gold tone finish on the lid. There is a small nick on the handle. No maker's marks or country of origin were observed. There are Lovely Floral Etching Designs throughout. The bottom of this pitcher states that it was made by Mirulas. I have shown close up photographs of the bottom. This pitcher is in good condition with no breaks, bends, or repairs. PUNCHED SILVER. NEOCLASSIC STYLE. STYLE NEOCLASSIC. TECHNIQUE SILVER CHISELED. AUTHOR/MANUFACTURER UNKNOWN PUNCH. PUNCH STAR 5 POINTS. AUTHOR"S PUNCH. MATÉRIEL ARGENT 900/1000. Fill with fresh flowers for a country flair. This has a white finish with black rooster design. Indoor or outdoor use. Rise & Shine Pitcher. Capacity: 10 Litres (2,64 US Gallon). A Rare Edditional Piece From a Retro Set Of Dishes. I am always happy to be of help. Great News! I am a Collector of Beautifully Crafted Treasures, and on my travels I find Top Quality and Wonder Filled objects, Treasures. Sterling Silver Cream Jug by Peter and Ann Bateman - Antique Georgian (1796). Sterling Silver Wine Ewer / Flagon by William Bateman I - Antique George IV.